A fact sheet on lower back pain, America’s #1 injury. Lower back pain is one of the most common medical conditions in the United States, ranking only behind heart disease and pulmonary disease in terms of burden to quality of life and mortality risk. And despite our advanced medical technology, the prevalence and severity of back pain has grown much worse in recent decades. But the good news is that doctors of chiropractic care specialize in diagnosing and treating the causes of all sorts of back injuries. Back pain is the most common physical ailment or injury that requires medical care. It’s estimated that 80 percent of adults in the U.S suffer from back pain at some point in their lives. And each year, 30 percent of the adult population will experience some sort of back pain. In fact, each year, one out of every two people will experience back pain severe that it’s noticeable and debilitating enough to affect his or her quality of life. 20 percent of all people will suffer back pain that limits or affects their work, and 5 percent won’t be able to work at all. How often do people go to the doctor because of back pain? Actually, back pain is the most common reason for patients to visit their doctor or medical professional. Each year, about 15 percent of the U.S. – around 50 million people – visit a physician with a complaint of back pain, a number that has increased steadily. Acute back pain is the reason for 3.15 percent of all emergency room visits. And 4 percent of patients are experiencing such acute symptoms that they need to be hospitalized. Studies show that as far back as 2004, the direct cost of treating back pain was already reaching $200 billion a year, and it’s only risen significantly since then. To demonstrate the trend of increased costs, between 1996 and 2004, the cost of spine conditions increased by 49 percent. Interestingly enough, the largest share of this cost increase was paying for prescription medications, not any kind of preventive care or more natural or holistic measures. How does it affect job productivity? Of course back pain takes a large toll on our ability to enjoy our lives, function around home and family, and leaves a gigantic medical bill. But it also costs us some serious money at the workplace. Each year, more than 25 million people miss an average of 7.2 days of work due to back pain, which adds up to 186.7 million days of work lost per year! Every year, back pain costs us about $22.4 billion in lost wages when employees have to miss work. In fact, back pain is the most common reason for job-related disability and the leading reason for missed workdays; in one study, 62 percent of employees who reported work limitations cited back pain as the leasing cause. Accidents from falls, sports, work, etc. Injured while lifting something heavy. Improper posture and use of technology. Being overweight and out of shape. Or trying to work out too vigorously after a long layoff. Spondylolisthesis, or lower spine slippage that causes a pinched nerve. Scoliosis and other spinal irregularities. How long does back pain continue? Some back pain can be considered minor and will get better naturally in a few days. But subacute low back pain lasts somewhere from 4 and 12 weeks. 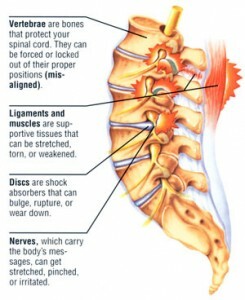 Chronic back pain goes on for 12 weeks or longer, even after the injury or cause of the initial pain has been treated. Even worse, about 20 percent of people who have acute low back pain develop chronic back pain, with symptoms that go on for at least one year. 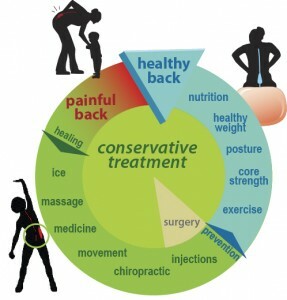 What factors go into the prevalence of back pain? Age: Lower back pain usually starts between ages 30 and 50 and gets worse with age, as people lose bone strength, muscle tone and elasticity, and intervertebral disc fluid naturally. Also, though well intention, people who are not used to exercising but jump into a strenuous fitness regiment often injure themselves. Genetics: No matter how well we take care of ourselves, some genetic conditions, like ankylosing spondylitis, make us more at risk of back pain. Occupational risk: Jobs that require heavy lifting or repeated stress on the spine or back of course see a higher instance of back injuries. Sedentary lifestyle: People who sit in the same position all day at work and go home to the couch have a much higher rate of back pain. Mental health factors: Believe it or not, some mental health conditions like anxiety and depression correlate with the prevalence and severity of back pain. Text neck: The unnatural and strained posture we assume when staring at our smart phones and computers is causing an unprecedented rise in neck and back issues. Backpack overload in children: While we all encourage a child read as many school books as possible, that doesn’t mean he or she should carry them all around in their backpack. In fact, the American Academy of Orthopaedic Surgeons recommends that a child’s backpack should weigh no more than 15 to 20 percent of the child’s body weight. How can we treat back pain? Most lower back pain is mechanical in nature, caused by a disruption in the way the spine, muscles, intervertebral discs, and nerves piece together and interact. Therefore, the best course of treatment often comes from a chiropractor, who specializes in repairing and restoring those functions, as well as promoting total body health, a strong immune system, natural, holistic healing, and even proper diet and fitness. A trip to a M.D. or hospital will too often yield a prescription for synthetic drugs, which may mask the pain but fail to address the root problem and come with some serious side effects. Even worse is the over-diagnosis of dangerous and debilitating back surgeries being needed before other treatment options are exhausted. If you’re experiencing pain in your lower back, back, or neck, come visit a chiropractor, first. He or she will be able to properly diagnose the problem and recommend rest, mobility and strengthening exercises, spinal adjustments, and even adjustments to your diet, posture, and sleep patterns in order to alleviate the problem, not just mask the symptoms. Chiropractic care may be the best way to treat seasonal allergies. Smile and laugh your way to better health.